It was exciting to have so many cheese flights to choose from. During our past Wine and Cheese Fridays, we’ve determined that we like hard cheeses the most. 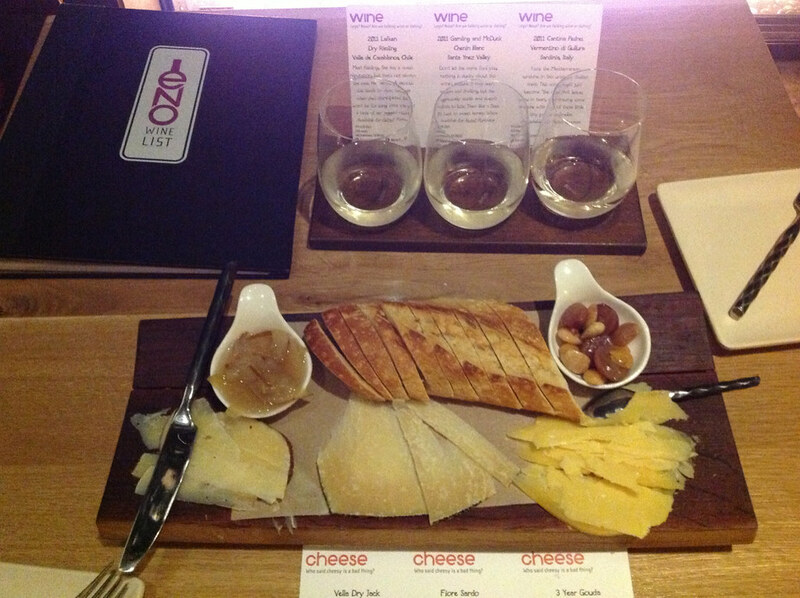 We chose the Hard liners cheese flight paired with the Dropping pH wine flight. This entry will have tasting notes for three wines and three cheeses. We started the wine tasting with a Lafken Dry Riesling. I noticed pear in the bouquet and an apple and pear finish. Neil picked up citrus and minerals in the taste and smell. Next we tried a Gamling and McDuck Chenin Blanc. Neil tasted minerals and lemon butter. I identified a floral smell with a strong flavor that reminded me of nail polish or vinegar. I was then reminded of war head candies, definitely strong! This wine was Neil’s favorite one. Our final wine was a Cantina Pedres Thilabas Vermentino. When we both tasted it, it was too much to handle. Neil said it was pungent, terrible and puckery. When I tried it, I noticed an instant feeling in the pit of my stomach. Guess the pH dropped too low for us! And now onto the cheeses. Cheese number one comes from Sonoma, CA, yay local cheese! It is a Vella dry jack made from cow’s milk. I found it to have a waxy, smooth and hard texture with a tart flavor. Neil called it dry and good. Our next cheese is Fiore sardo made from sheep’s milk. I thought it was crunchy, dry, and a little funky, but definitely good! Neil described it as dry and crumbly, salty, and without an overbearing barnyard flavor. We finished out the cheese tasting with a three year Gouda, made from cow’s milk. It was delicious and we felt it was much different than the other Gouda we had for a past Wine and Cheese Friday. (http://mferraro73.tumblr.com/post/53902916085/cabernet-sauvignon-and-smoked-gouda-6-21-our) When I tasted it there were so many different textures; crunchy, smooth, creamy and chalky. Neil said it was nutty, smoky and goooo-da. Our Wine and Cheese entry wouldn’t be complete without the wine and cheese pairings, so without further ado..
We tried the Vella dry jack and Riesling together first. I think I tasted more fruit in the wine but it was strange because the wine and cheese didn’t really influence each other they seemed separate. Neil found it to be a good pairing and the cheese got saltier with the wine. Our next pairing was Fiore sardo and Chenin Blanc. We both noticed the cheese in this pairing. Neil thought the cheese got drier with the wine while I detected the cheese to overpower the wine. The last wine and cheese was the three year gouda and Vermentino. During our wine tasting this wine was too sour for us. When we combined it with the cheese the wine briefly became sweeter but then the puckery flavor came back. This was a great chance to try out some new wines and cheeses and although these wines weren’t my favorite, I’d love to try the cheeses with some different wines.